Africa’s BIGGEST Educational Exhibition is here! 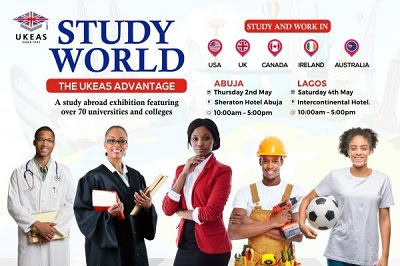 The UKEAS Study World Exhibition, May 2019 is here everyone and it only gets BIGGER & BETTER with over 70 International World Standard and Premium Institutions in Abuja, Lagos, Accra and Kumasi. The Study World Exhibition is a bi-annual overseas study fair organized by the United Kingdom Education Advisory Services, UKEAS Nigeria. This conception brought to you by UKEAS has led to thousands of Nigerians being beneficiaries of free and efficient counseling, scholarships and world standard education. Now in its 8th year it remains the biggest educational fair in Africa, taking place in Lagos, Abuja, Accra, Kumasi and other regions! So, if you’re one of those dreaming of studying in the UK, USA, CANADA, CHINA, GERMANY, AUSTRALIA, MALAYSIA and many other dream study destinations but you don’t know where to start or even the tiniest clue on how to go about it?, Then you are at the right place. Well, time to smile! Join over 70 foreign universities and colleges at the UKEAS STUDY WORLD EXHIBITION and be part of thousands of beneficiaries of free and efficient counseling, scholarship opportunities, career and job mentorship abroad, world standard education, study visa guidance and lots more! Attend the UKEAS STUDY WORLD EXHIBITION happening in your city. © 2019 Copyright. All Rights Reserved!